I have taken ownership of Ariadne, a Shaw 24 from Eban Shay. She has been moved to Olympia to await restoration. It will be a daunting task, but the reward will be satisfying. I plan to join the SSSS (South Sound Sailing Society) to tap into the knowledge of local sailors with experience in old boats. After having Ariadne for several years planning to replace the deck and cabin, I have to let the lovely boat go. The deck and cabin still needs replacement. The restoration would be basically starting over with the hull. It has a 1 cylinder Yanmar that ran years ago, old sails, aluminium masts that aren't in the greatest shape. Ariadne is an impressive vessel - the thickest fiberglass on a 24 ft boat I've ever seen. I'm not looking to sell it, I want it to go to someone who really would love to have and fix this piece of history. 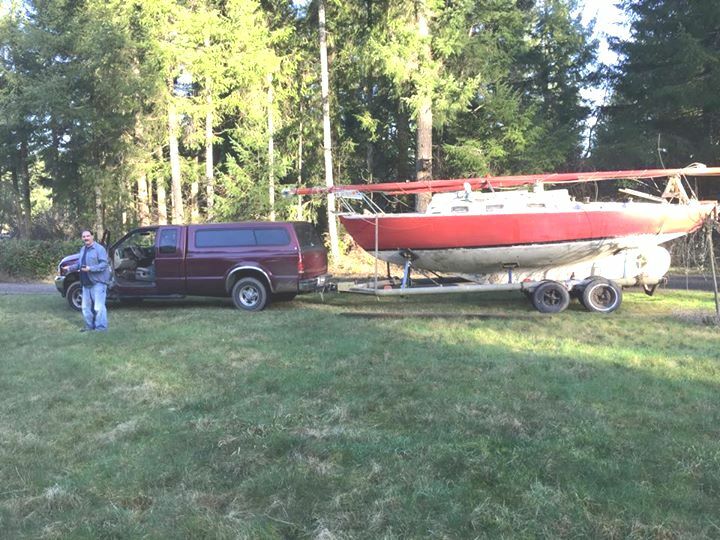 The boat is located in Arlington Washington. If you know anyone who wants it let me know my phone number is 425 330 3226. August 20, 2012. We received the following email from Eban Shay. (minor edits). 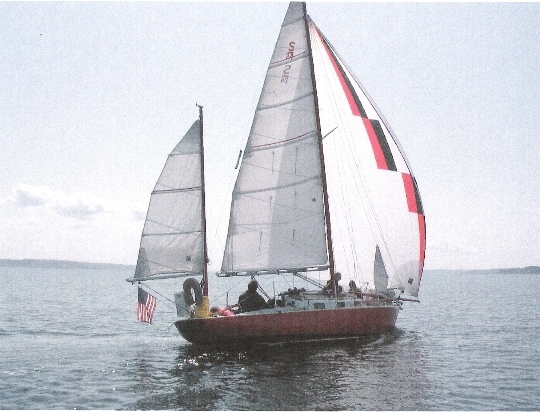 This boat was formerly Chris Peragine's Ariadne, a Shaw 24, also in Seattle, Washington; and before that OJ Young's Elva,, New Orleans, Louisana. Ariadne has not been broken up - she is alive and well resting on the hard in a barn in Arlington, Washington, awaiting a new deck and cabin. I got her for free from the Wooden Boat Center in Seattle. My friends and I have taken many trips to Canada on her, but her topsides need some fixing - the plywood decks and cabin have delaminated and she leaks rain water profusely. I recently got a chance to talk to Chris Peragrine who owned her for 20+ years he also thought that Ariadne had been broken up. Chris was ecstatic that Ariadne was alive and he shared some wonderful stories of her. I was blown away myself getting a free boat that turned out to be classic and relatively famous. I will keep updates on the restoration progress and hopefully she will be back in the wind before to0 long. This is interesting - since this website went online 5+ years ago Ariadne must be the 4th or 5th boat reported to have been broken up, only to have turned up sailing, or in someone's barn, waiting. The following is the ' chrono record' we had of Ariadne. Chris Peragine sold Ariadne in late 2004 and then she fell on hard times. After a long, hard working life she was reportedly broken up and sold for lead and parts. Someone has to tell us more! And someone has - Chris himself. He sold Ariadne shortly after the circumnavigation and reports, sadly, that he thought she has been scrapped. He reports that Ariadne won the M.O.R.C. championship in 1962. She was built in Texas, 'stove in' by a hurricane and arrived in New Orleans as the first fiberglass!! hull in the Southern YC fleet. She won the Gulfport - Pensacola race in 1963. Chris is now rehabilitating a Morgan 34 that he sailed up from Portland to Seattle. He is going to convert this keel/centerboarder to a yawl and plans to sail her back to his old hometown, New Orleans. Dyke Williams, owner of Trina, Shaw 24 hull #1, wrote in his Good Old Boat Magazine article that some twenty four Shaw 24's were built in wood. When your webmaster heard of Shaw 24's with fiberglass hulls this was a surprise. In the Sparkman & Stephens files was a February 13, 1964 memo from Rod Stephens referencing a conference attended by George O'Day, Lyman Bullerman, CEO of O'Day Corp, Bob Larson of US Yachts and Rod Stephens. The last part of this memo is below. The Gulf units were produced (bootlegged, seemingly) by an outfit that went broke - or worse. Rumor has it that 30 or 40 units were produced and sold. Bill Shaw has no facts and received no royalties. George and Bob agreed to see what they could find out and let us know. The Canadian competion is legitimate. The producer has limited production; perhaps 30-40 per year. These yachts will affect DOLPHIN sales in Canada. How much will depend on the workmanship and performance of the boats. However, this is legitimate competition and there is nothing to be done at this time. R.S." We are following up with Chris on Ariadne's fiberglass hull and will try and contact the owner of the Dolphin 24 in his club. June 21, 2011. The boat Chris refers to at his club is Carl Harrington's Esther, Yankee #89. Click here to go to there. …We added a "deployable bowsprit" a few seasons ago that carries an Melges 24 assymetrical chute. Whata picture! Musta been having a(nothe)r mid-life crisis as at that same time I pushed the mast up from the keel and put a wood post below and now have (still!) a fractional rig and larger main. "Heavy"Displacement rules! Those sad new boats like the Melges and these other 24ft-ish so-called 'Sports Boats' miss the point ENTIRELY - the Public has lost out and they don't even know it. Your Site, in showing those CCA Classics and the reverence they demonstrate for the notion of _Accessible Sailing_, is more than History - it helps preserve a Standard people might one day want to TRY to recover!! Here's What I know: Fell in absolute love with this boat when I was 12 when the old man who owned her invited me aboard. The wood ribs of the cabin overhead, the lil inboard, and that mizzen! She was built in Texas in either 57 or 59 - 59 I think "5th fiberglass hull built in the US"(deck and trunk are wood) holed in a hurricane. Bought by Olympic sailing medallist O.J. Young - then a New Orleans boatyard owner. With her he won the MORC Championships in, I think, '61 and dominated Handicap racing for years as one of the very first fiberglass "lightweights" in Lake Pontchartrain and the Gulf Coast which culminated in the Class and Overall victory for the Gulfport to Pensacola Ocean Race in '62........... (musta been a windy reach with the mizzen staysl as the secret weapon). Don't know the Dolphin24! But they are VERY nearly the EXACT same boat!!!!! - 'cept yawl have a crying need for a Mizzen Conversion Kit. The Shaw24 has reverse sheer, ever so slightly - here's my quick visual Comparison: S24 has a 1 foot deeper keel, which is shorter a little as well, and her rudder is deeper and more elliptical. She has less freeboard by a few inches. Do yawl have a "bridge" separating the cockpit from the companionway, too? Cabin Trunk and portholes - exactly the same! Bill Shaw......"he did a half size proto-type for the Office (S&S where he was working) of _Finnesterre_ just to test the principles - that's your boat!" - Gary Mull told me that - and he went on to say... "That boat with a jib and a jigger could sail through anything ". I've have probably taken that too much to heart. BTW! Did you catch in one of the mags "An Interview with Olin Stephens" RECENTLY (I mean within the year); I don't have it at hand - damn - I'll look later - but in that He, per my reading, -regrets- the keel/centerboard as a Dangerous Phase - (paraphrasing to be sure): " I wouldn't again design boats that 'won't come back' (from a roll-over knockdown) - Did you see this? - I'll have to find it for you. Startled!! me; as I've always assumed my "heavy lil yawl could do anything - and I'm Offshore in her regularly, OK - once a Summer, working along the West Coast of Vancouver Island - she's always "come back" for me. so Anon CP must be Chris Peregrine!